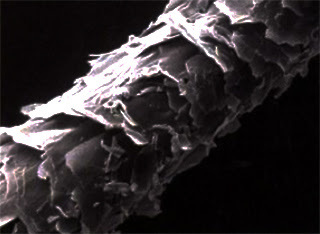 As a polymer scientist with a love for biological structures, I find hair and skin to be extremely fascinating systems. Human hair is an intricate composite structure comprised of keratin proteins, lipids, polysaccharides, water and pigment particles. All of the individual components are complex and perform very specific functions. Those of us with curly hair are concerned a lot about our hair’s texture and porosity (a popular buzz word of late). These two factors are primarily based upon the structure of the cuticle — the outer layer of our hair. 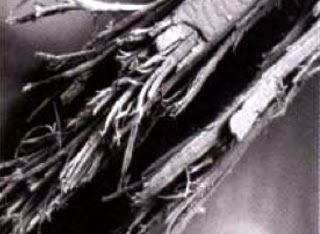 The scanning electron microscope image in Figure 1 shows highly magnified detail of the exterior surface of a strand of human hair. The external layer is called the cuticle, and is much like bark on a tree. Both the cuticle layer and tree bark are made up of many smaller, individual pieces (called scales when referring to the cuticle) that work together as one overall unit to perform a function. The job of the cuticle is to provide protection to the hair shaft from mechanical and thermal damage, while allowing moisture in and out as needed. The cuticle structure is an amazing work of nature, because it is strong, yet flexible, and is made up of many pieces, which allows it to act as a seal to protect the inner cortex of the hair, and yet also allows it to be permeable, or porous. The center of the hair shaft is referred to as the cortex, and is a very complicated structure filled with many different substructures and clusters of structures made of keratin protein, lipids, and other matter. Water provides the means for the necessary hydrogen bonding between the keratin fibers to occur that is essential for the maintenance of hair strength, elasticity and integrity. Without moisture in the cortex, the hair becomes thin, frizzy, and much more prone to permanent damage and breakage. Thus, the cuticle layer performs a very important duty by protecting this delicate interior of the hair and helping it maintain the proper balance of moisture. The cuticle itself is a multi-laminate structure, like stacked sheets of paper, composed of fatty acids, proteins, and other cellular matter. Below is a description of each layer. Epicuticle — This surface layer of the cuticle is made up of lipids and proteins and is also found on the bottom of the stacks of layers. A-Layer — This layer is comprised of proteins very high (35%) in cystine, which enables the layer to be highly crosslinked. This layer gives toughness to the hair and also provides physical protection from heat and other potential threats. Exocuticle — This layer has approximately 15% cystine, so it is less strong and tough than the A-Layer, but provides similar protection. Endocuticle — This layer contains only 3% cystine, and so is only very lightly crosslinked. This means that this layer is the only cuticle layer to swell in the presence of water. This causes the entire cuticle to swell and lift away from the hair shaft, resulting in a ruffled cuticle that allows the passage of material both into and out of the hair. Cuticular Cell membrane Complex (CMC) — This layer is made up of polysaccharides and several lipids (fatty acids). This layer acts as the glue that holds the cuticle together and holds it to the hair shaft. A perfectly healthy hair that has not been exposed to harsh chemical processing, prolonged sunlight, or rough thermal and mechanical treatments (often called “virgin hair”) will have a cuticle layer such as the one shown in Figure 1. 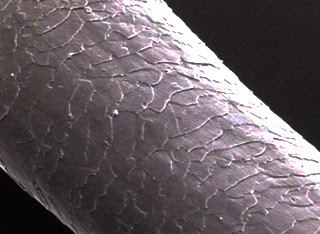 The individual keratin scales lie very flat, have fairly smooth edges, and overlap one another, forming a flat, tight sheath around the interior of the hair shaft. A hair in this condition is highly protected from the environment, retains the most moisture, and generally is more reflective, giving the hair shine and gloss. (This latter feature is variable, depending upon the color and the degree of curl of the hair). Unfortunately, most of us don’t have hair protected by such a beautiful, intact cuticle. As hair ages, it is continually exposed to sunlight, water, pollution and external mechanical forces. UV radiation from sunlight can break down some of the keratin bonds and cause deterioration of scales and cause them to lose some of their structural integrity. Mechanical forces such as combing, bruising, curling, pinning up or binding the hair can all catch the edges of cuticle scales and ruffle or raise them, creating a rough surface more prone to tangling and tearing. Rough treatment can even pull cuticles off entirely. These (scary) images show strands that have had extensive damage done to the cuticle layer from chemical processes (coloring, perming, relaxing). It is evident from viewing these images that once the cuticle layer is damaged, the cortex becomes exposed and the entire hair is extremely vulnerable to virtually any threat. The best solution in these extreme cases is to have a professional stylist trim the hair. Next month I will discuss how the cuticle layer and our treatment of it affects porosity and what that means for our hair. I am 5 months natural and have a permanent hair color in my kinks and curls. My hair seems to be very healthy and growing. However, lately I have been detangling daily with a wide tooth comb and conditioner instead of using gel. After combing, I notice a few short pieces on the comb. They are not split. Is this ok or am I adding too much stress to my hair?